Ruffwear Dog Boots: Are They Worth The Price Tag? Your furry canines are your companions for life. They join you on freezing morning walks, rainy evening runs, and rugged mountain hikes. Having these valuable companions by your side definitely gives you a boost. They always ensure that you’re safe and sound during your trips. So, for all the love and affection they give you, it’s only fair that you provide them with the best. And what better way to protect their little paws than the Ruffwear dog boots. Ruffwear is a popular brand among dog owners. They pride themselves on providing everything you could need for a dog under one roof. Your dog might face a lot of challenges in the outdoors. Its paws might be slipping or it might be feeling cold or worn out. A pair of Ruffwear dog boots helps to protect your dog from these harsh elements. Not only that, but the materials also protect its sensitive skin from harmful chemicals and irritating insects. So, what makes these dog boots so special? Are they the best in the market? If so, how do you select one for your dog? Read ahead to have all your queries answered. Ruffwear pulls all the stops in their most expensive pair of boots for dogs. The Polar Trex are high-performance boots that help provide your dog’s paws with warmth, traction, and protection. They are perfect for the winter weather where it might be too cold and slippery outside. Designed with a softshell fabric, they provide the best insulation against the freezing cold. At the same time, they manage to be breathable so your pet doesn’t sweat a lot. On the other hand, the tough Vibram outsole includes patterns that help maintain a firm grip, even on ice. The boots also include reflective accents so your pet is always visible. This guarantees its safety from car drivers and cyclists. Another advantage of the boots is that they’re quite easy to secure. They include a hook and loop system that cinches on the narrow part of their legs. This allows you to quickly put the shoes on and go. Also included is a pullover stretch gaiter that goes on over the boots. It helps add another layer of protection while securing the closure system as well. The best part is that they are easily washable by machine or hand. This makes them easier to clean; however, you should always follow the washing instructions the boots come with. 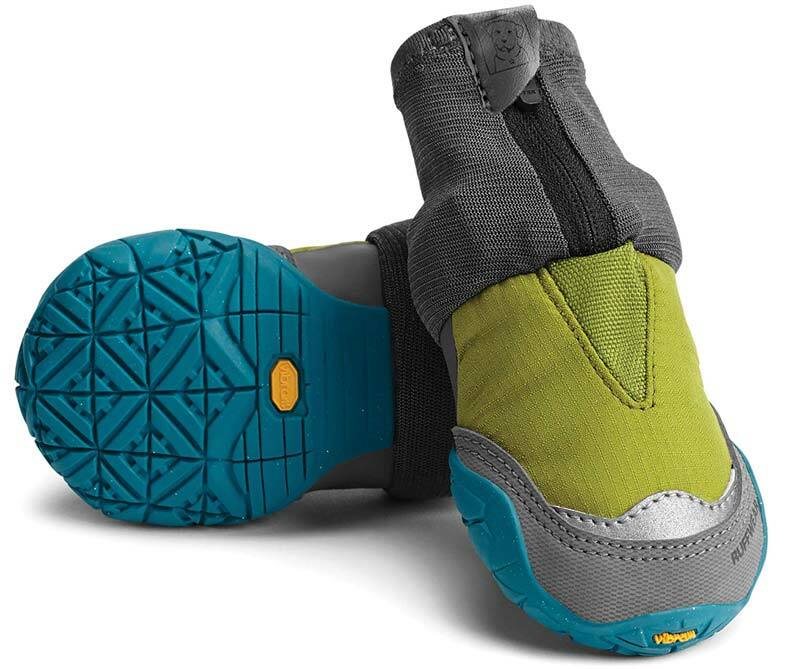 For outdoor pups that love to travel, hike, and run in all kinds of weather, the Grip Trex is perhaps the best. Ruffwear designed these boots to be especially high-performance outdoor wear as they provide the ultimate protection for your dog. They feature a rugged out sole constructed out of Vibram. The resilient material is popular for its sturdiness and durability. The outsole also includes various patterns to ensure a stronger and secure grip on all kinds of terrain. Moreover, the upper part of the boots is made out of tightly woven air mesh that provides breathability and flexibility so your dog can easily run and walk without any restrictions. The mesh further keeps any dirt and water out yet still allows the paws some breathing room. The best part is that they are easy to secure. For those who have jumpy or excited dogs, they do not have to worry about getting the dogs to sit still for too long. Their hook and loop closure make it easier to put them on. However, we recommend that you keep checking the tension on the boots after every 15 or 20 minutes. In fact, you can even let your dog run around in muck and mud as these boots are quite easy to wash. Lastly, they are quite inexpensive so you can use them every day. If you’re looking for affordable everyday wear for your dog, there’s none better than the Summit Trex. These boots provide protection to your dog’s paws from all the harsh elements of nature. This includes abrasive surfaces, snow, hot sidewalk, salt or other chemicals. Not only this, but they provide traction so your dog doesn’t slip. Equipped with a weather resistant upper, the Summit Trex lock out all moisture, dirt, and debris. This way, your dog can run or walk without worrying about the elements. It also features a hook and loop cinch system that makes it easy to secure. To add to the secure fit, the boots come with a stretch gaiter that fits at the narrowest part of their leg. Thus, the boots remain on for longer. The outsole is as rugged as it is flexible. The traction grip ensures that your dog never slips on the snow. Also featured are reflective accents or trim that are quite handy in a low-light environment. They allow you to keep an eye on your dog and ensure he is safe and sound. Also, the boots are washable by machine or hand which makes them easier to use. How Do Ruffwear Dog Boots Help Your Dog? Ruffwear takes pride in sourcing only the best materials and designing products for the ultimate comfort of dogs. Their dog boots are no different. In fact, they put in the same efforts and workmanship that regular human boots require. The results are comfortable dog boots that any dog would be happy to have. The company manufactures three different kinds of boots, where each is specifically designed to assist the dog in different environments. All in all, they can help your dog in the following situations. Try walking on the hot sidewalk with your bare feet. Chances are that you would feel the skin on your soles melting. So, why should your poor pup have to go through this? Ruffwear’s Summit Trex dog boots are perfect for walking on hot sidewalks. They feature a light and breathable upper fabric so that your dog’s paws don’t become too heated. Also, the sturdy Vibram sole protects the paw pads from the heat. While hiking, you may come across pebbly or sharp floors or a dense forest floor. Your dog needs to cover its paws otherwise, he might rub them raw. The Grip Trex are perfect for all kinds of terrain as they feature a Vibram outsole that is sturdy and resilient. The upper also keeps out any dirt and debris. Always ensure that the boots are tightly fitted so that they do not slip off or allow any small stones inside them. Your furry little friends might not be too bothered with the cold weather, especially snow. In fact, they enjoy the cold as their fur protects them. However, salt or other snowmelt chemicals can harm the skin on their paws. On the other hand, slippery ice makes it hard for them to walk or run without slipping. Ruffwear’s Polar Trex dog boots provide your dog with the perfect protection from snow and ice. The fabric upper is warm yet breathable so your dog doesn’t feel cold. They include a stretch gaiter that prevents any cold from entering their paws. Also, the rugged Vibram soles provide your pup with the grip he needs to walk comfortably on ice. While hiking, ants and other insects might stick on to your dog’s fur which results in bites and itchy skin. To prevent insects from climbing aboard, Ruffwear dog boots are perfect. They protect the paws and ensures no insects ever bite through them. There is a wide selection of methods through which you can measure the size of your dog’s paw. Ruffwear measures their sizes from the toenail to the edge of the back paw. They include a sizing guide on their website as well. This includes a scale which you can print out. However, when measuring your dog’s paws, it is necessary that you trim his nails. Another precaution is to ensure that his feet are perfectly laid flat against the surface. This ensures that the measurement is accurate. Print out the scale from the Ruffwear website. Ensure that the scale is set to 100% otherwise, you might end up with an inaccurate chart. Have your dog stand on the paper. Put one of his paws on the paper and lift the other one up. This way his paw will be fully splayed out. Ensure that the edge of his back paw is at the designated line. Now, look where the edge of his toenails lies on the scale. If your dog’s paw lies between two sizes, then it is best to go for the bigger size. You can always put them on with socks for a more secure fit. Going for short ones may cause hot spots or general discomfort. Repeat the procedure with all the other paws. Incorrectly sized boots are no joke. They can result in alopecia or rubbed feet. Picking out the correct size is crucial to the comfort and health of your pup. Remember that the size of the rear paws may be larger than the front ones. This is why it is much better to buy the dog boots in two pairs of two. This way you can customize the fit more accurately. Otherwise, you might end up with boots that are too tight on the rear paws but too large on the front. Ruffwear dog boots come with various advantages to help your dog out in tough times. However, they do include a few drawbacks that can often deter pet owners. Ruffwear construction involves sturdy materials that are specifically chosen to last years. The manufacturers understand that your dog may like to walk or run a lot. So, they have manufactured shoes that can take a tough beating. 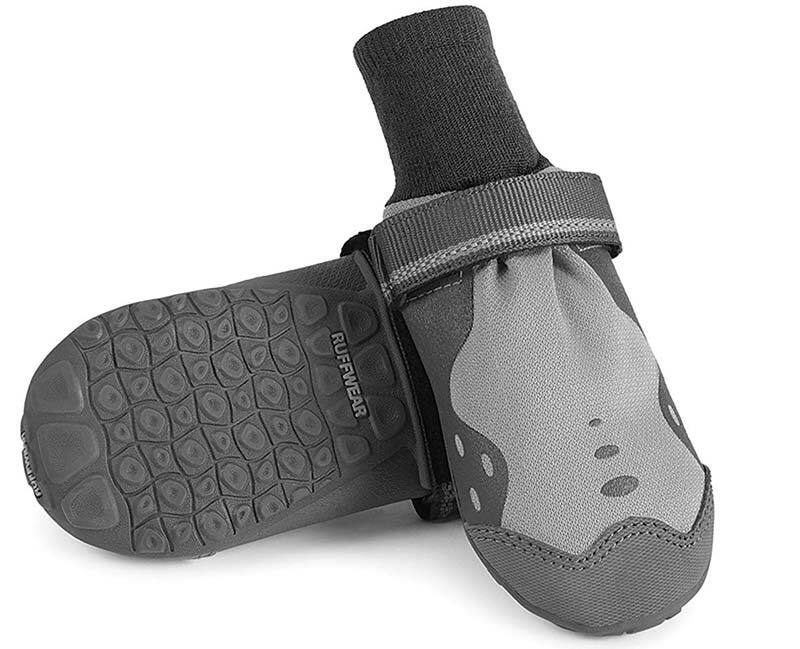 All the Ruffwear dog boots include Vibram soles that provide great traction. This ensures that your dogs have a secure grip on the surface. All the boots include reflective accents on them. This way, you can always keep an eye on your dog in low light situations. Furthermore, they protect your dog from harm as they are immediately visible to drivers or cyclists. Another common benefit of all Ruffwear boots is that they are machine washable. All you need to do is put in detergent and let the machine do its work. One of the key features of these boots is that they protect the dog’s paws for extreme weather as well as dirt and moisture. 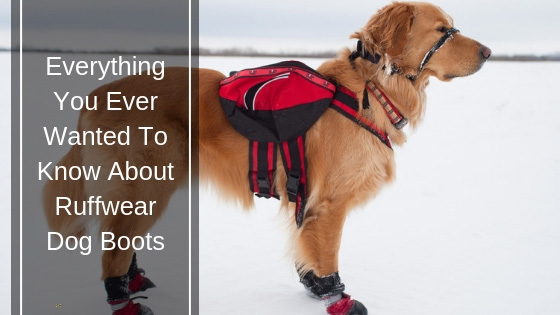 Also, if your dog has sustained any injuries or has sensitive feet, then the boots will help protect him from any harsh chemicals or elements that may further cause him discomfort. Another benefit is that you can use them indoors to protect your floors. Before entering the house, you can have your dog wear the boots so they don’t get dirt or mud all over the floor. These boots also protect the floor from claw marks. Granted that you picked the correct size, the Ruffwear Boots are easy to put on. They all feature a loop and cinch mechanism that allows you to quickly put the boots on. While your dog may not care if his shoes are hot pink or a deep baby blue, the variety in colors still allows you to pick out the best for your dog. Dewclaws are an inherently sensitive part of a dog’s paws. Howeve​​​​r, the position of the dewclaw is different for every breed of dog. For some, the boots may be cinching right where the dewclaw is. This can be quite dangerous as it rubs the sensitive parts, injuring them. So, inspect the shoes after every 15 minutes if they are hurting your dogs. A common complaint among buyers is sizing. While the sizing on the website may be accurate, you might be making a mistake. Remember that each paw may have a different size especially the rear and the front ones. We recommend that you ask for professional help in determining the correct size. All in all, dog boots can be an immense help if you pick them out correctly. Ruffwear has changed the game with its durable and comfortable boots. They not only protect your dog from the harsh elements and chemicals but also ensures they remain safe from injuries. The ultimate choice is yours. As a pet owner, only you would know what is the best fit for your dog. To reiterate, if your dog loves hiking and trekking, then go for the Grip Trex while the Polar Trex is perfect for extreme winters. On the other hand, if you just wish for everyday boots, the Summit Trex is the most suitable. So, which will it be? No matter what you choose, Ruffwear’s exquisite quality and workmanship will always be on your side. They might have a few cons; however, the pros outweigh them by a large margin!